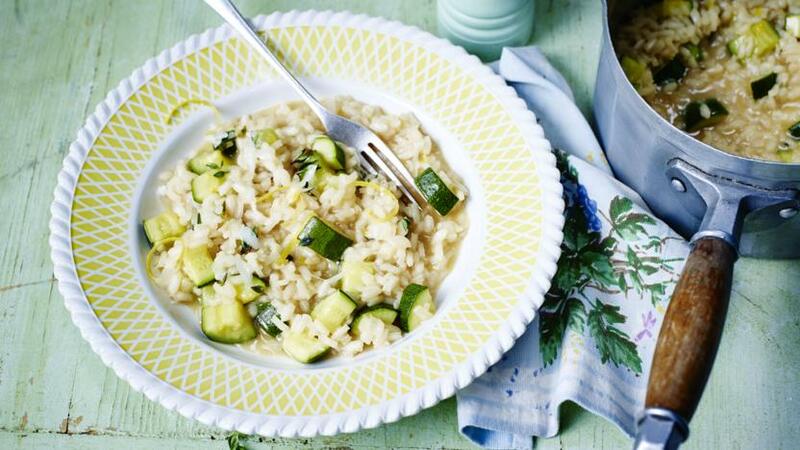 This gorgeous summertime risotto is a favourite with kids and the cold leftovers can be used to make tasty arancini. Each serving provides 440kcal, 11g protein, 42g carbohydrate (of which 2g sugars), 21g fat (of which 13g saturates), 1.5g fibre and 1.4g salt. Bring the stock to a simmer in a saucepan, then keep warm over a low-medium heat. Heat the butter in a large, heavy-based saucepan over a medium heat. Add the shallots, garlic and thyme and fry for 1-2 minutes, or until softened. Add the rice and stir well until it is coated in the melted butter. Add the wine and simmer until it has almost evaporated. Add a couple of ladlefuls of the hot stock to the pan, bringing each to a simmer and stirring regularly, until the rice has absorbed most of the liquid. Continue to add the stock a little at a time, stirring the rice regularly. When half of the stock has been added to the rice, stir in the courgettes, then continue to add the remaining stock until the rice is tender but has a slight bite ̶ about 15-18 minutes total cooking time. Stir in the parmesan, lemon zest and lemon juice (to taste). Season well with salt and freshly ground black pepper. Serve in bowls, sprinkled with more grated parmesan.